To ensure that you have effective listening skills, we are going to explore a wonderful story written by Carmen Colombo. She is going to help us learn about patience. What do you know about being patient? Patience is a virtue, this is great idiom. It is true, but most of us lack the patience we need to succeed. 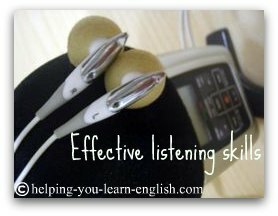 What about your goal to obtain good listening skills? Do you have enough patience to reach your goal? If you find yourself frustrated, when you don't understand or make mistakes, I want you to remember this story I am about to tell you. Sit back, relax and listen. Ok, now listen to it again. Yes...again please. Have you listened to the story at least twice? Good. This is a great exercise; listening to audio without reading. Just relax and enjoy the fact that you are learning something new. Be patient with yourself. Absorb as much as you can without reading on a regular basis and you will build effective listening skills that you can use in the real world. Ready to listen with the text? So now you have heard it, read it while listening to it, and looked at the vocabulary. Now I want you to try reading the story aloud with me. Get those English speaking muscles strong. Now, let’s explore the story some more. Let’s look at the words. To have effective listening skills we must understand what most of the words mean. Click here to visit my vocabulary activities glossary, to help you understand some of the difficult words. Consider this like going to the gym. At the gym you lift weights to tone and strengthen your muscles. Do the same for your English muscles. 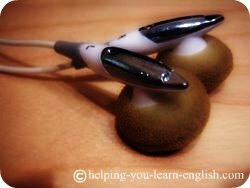 Try to sound like me to help improve your pronunciation. Now here is a story of my own. Rebecca is from Huelva, Spain and studying English. She desperately wants to learn English, but wants to know it all now. She decided that the best way to learn, would be to move to England to immerse herself in English. After 3 years abroad she hadn't improved at all. She was getting impatient and frustrated. One afternoon when she got home from work, her neighbor (who's name she still didn't know...) was outside in his front garden. He saw her coming and he smiled. He got up and was about to say hello when Rebecca put up her hand and said "Sorry, I need to study English", and went inside. She removed her jacket and went directly to her home office. She opened her new grammar book and began to read with a pencil and paper handy. After 2 hours, she stopped because she was so frustrated. "I study everyday for hours. I live in England and I still don't know English. All I know is, Sorry, I need to study English." * Why isn't Rebecca learning English? * What is she doing wrong? * How could she improve her English? Leave your comments, reactions and advice below. The Bigger World Beyond the Window. Do not be Rebecca. Please! Are you missing great opportunities to use your English, like this student is? She is making it harder for herself; are you doing the same thing? The biggest mistake that she is making is studying for hours alone in her house, when there are real people outside who want to interact and speak with her. The best way to develop effective listening skills is to listen to real English, not study a grammar book. Using your English is much more rewarding and helpful than sitting alone in your home with a book. Your goal isn't to know English; your goal is to use it to communicate with others.